The Tea Act of 1773 was one of several measures imposed on the American colonists by the heavily indebted British government in the decade leading up to the American Revolutionary War (1775-83). The act’s main purpose was not to raise revenue from the colonies but to bail out the floundering East India Company, a key actor in the British economy. The British government granted the company a monopoly on the importation and sale of tea in the colonies. The colonists had never accepted the constitutionality of the duty on tea, and the Tea Act rekindled their opposition to it. 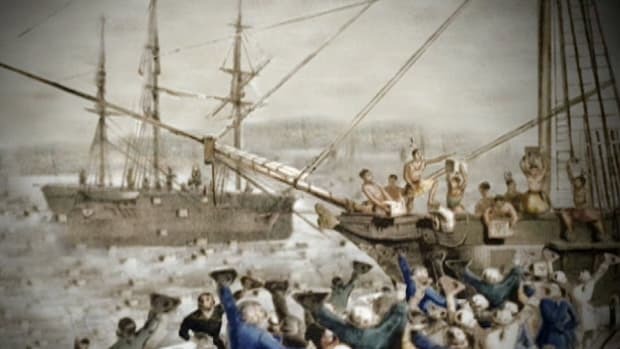 Their resistance culminated in the Boston Tea Party on December 16, 1773, in which colonists boarded East India Company ships and dumped their loads of tea overboard. Parliament responded with a series of harsh measures intended to stifle colonial resistance to British rule; two years later the war began. In 1763, the British Empire emerged as the victor of the Seven Years’ War (1756-63). Although the victory greatly expanded the empire’s imperial holdings, it also left it with a massive national debt, and the British government looked to its North American colonies as an untapped source of revenue. 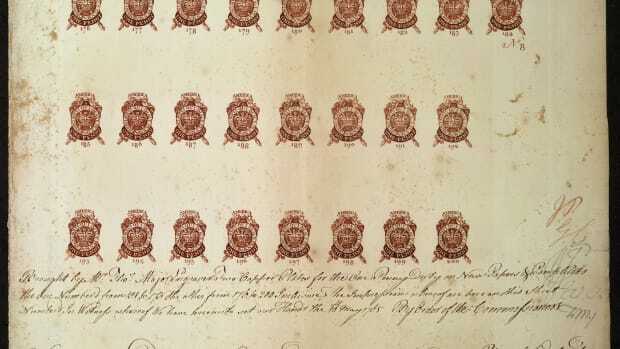 In 1765, the British Parliament passed the Stamp Act, the first direct, internal tax that it had ever levied on the colonists. 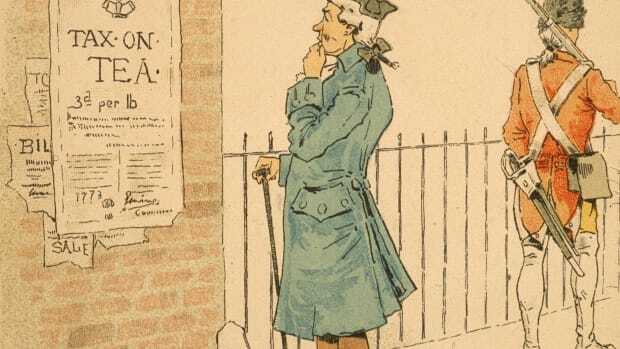 The colonists resisted the new tax, arguing that only their own elective colonial assemblies could tax them, and that “taxation without representation” was unjust and unconstitutional. After the British government rejected their arguments, the colonists resorted to physical intimidation and mob violence to prevent the collection of the stamp tax. Recognizing that the Stamp Act was a lost cause, Parliament repealed it in 1766. Did you know? Each year around the anniversary of the Boston Tea Party, a re-enactment party is thrown in Boston and visitors can tour replicas of the Dartmouth, the Beaver and the Eleanor, the three ships that were docked in the Boston Harbor and loaded with the East India Company&apos;s tea. Parliament did not, however, renounce its right to tax the colonies or otherwise enact legislation over them. In 1767, Charles Townshend (1725-67), Britain’s new chancellor of the Exchequer (an office that placed him in charge of collecting the government’s revenue), proposed a law known as the Townshend Revenue Act. This act placed duties on a number of goods imported into the colonies, including tea, glass, paper and paint. The revenue raised by these duties would be used to pay the salaries of royal colonial governors. Since Parliament had a long history of using duties to regulate imperial trade, Townshend expected that the colonists would acquiesce to the imposition of the new taxes. Unfortunately for Townshend, the Stamp Act had aroused colonial resentment to all new taxes, whether levied on imports or on the colonists directly. Moreover, Townshend’s proposal to use the revenue to pay the salaries of colonial governors aroused great suspicion among the colonists. In most colonies, the elective assemblies paid the governors’ salaries, and losing that power of the purse would greatly enhance the power of the royally appointed governors at the expense of representative government. To express their displeasure, the colonists organized popular and effective boycotts of the taxed goods. Once again, colonial resistance had undermined the new system of taxation, and once again, the British government bowed to reality without abandoning the principle that it had rightful authority to tax the colonies. In 1770, Parliament repealed all of the Townshend Act duties except for the one on tea, which was retained as a symbol of Parliament’s power over the colonies. The repeal of the majority of the Townshend Act took the wind out of the sails of the colonial boycott. Although many colonists continued to refuse to drink tea out of principle, many others resumed partaking of the beverage, though some of them salved their conscience by drinking smuggled Dutch tea, which was generally cheaper than legally imported tea.The American consumption of smuggled tea hurt the finances of the East India Company, which was already struggling through economic hardship. Although it was a private concern, the company played an integral role in Britain’s imperial economy and served as its conduit to the riches of the East Indies. A glut of tea and a diminished American market had left the company with tons of tea leaves rotting in its warehouses. In an effort to save the troubled enterprise, the British Parliament passed the Tea Act in 1773. The act granted the company the right to ship its tea directly to the colonies without first landing it in England, and to commission agents who would have the sole right to sell tea in the colonies. The act retained the duty on imported tea at its existing rate, but, since the company was no longer required to pay an additional tax in England, the Tea Act effectively lowered the price of the East India Company’s tea in the colonies. If Parliament expected that the lowered cost of tea would mollify the colonists into acquiescing to the Tea Act, it was gravely mistaken. By allowing the East India Company to sell tea directly in the American colonies, the Tea Act cut out colonial merchants, and the prominent and influential colonial merchants reacted with anger. Other colonists viewed the act as a Trojan horse designed to seduce them into accepting Parliament’s right to impose taxes on them. 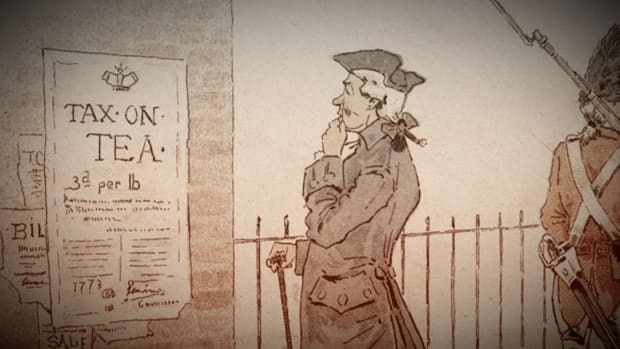 The fact that the agents commissioned by the company to sell its tea included a number of pro-Parliament men only added fuel to the fire.The Tea Act revived the boycott on tea and inspired direct resistance not seen since the Stamp Act crisis. The act also made allies of merchants and patriot groups like the Sons of Liberty. Patriot mobs intimidated the company’s agents into resigning their commissions. In several towns, crowds of colonists gathered along the ports and forced company ships to turn away without unloading their cargo. The most spectacular action occurred in Boston, Massachusetts, where on December 16, 1773, a well-organized group of men dressed up as Native Americans and boarded the company ships. The men smashed open the chests of tea and dumped their contents into Boston Harbor in what later came to be known as the Boston Tea Party. The Boston Tea Party caused considerable property damage and infuriated the British government. Parliament responded with the Coercive Acts of 1774, which colonists came to call the Intolerable Acts. 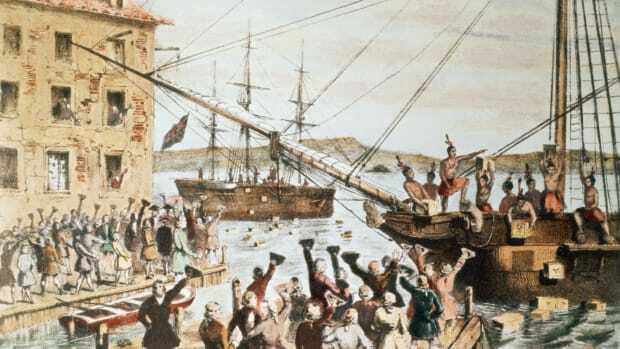 The series of measures, among other things, repealed the colonial charter of Massachusetts and closed the port of Boston until the colonists reimbursed the cost of the destroyed tea. Parliament also appointed General Thomas Gage (1719-87), the commander in chief of British forces in North America, as the governor of Massachusetts. 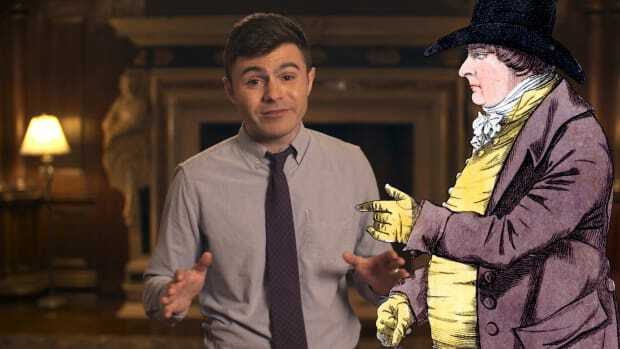 Since the Stamp Act crisis of 1765, radical colonists had warned that new British taxes heralded an attempt to overthrow representative government in the colonies and to subjugate the colonists to British tyranny. The Coercive Acts convinced more moderate Americans that the radicals’ claims had merit. Colonial resistance intensified until, three years after Parliament passed the Tea Act, the colonies declared their independence as the United States of America.